Most of the insurance policies in India presently are exclusively in the domain of life, non-life (health) & pension. While life & non-life insurance schemes are regulated by Insurance Regulatory Development Authority (IRDA), pension schemes are regulated by Pension Fund Regulatory & Development authority (PFRDA). With the opening up of the Insurance sector in 1999, the number of companies, both in life and non-life, have gone up to 49 and the new era has seen the entry of international insurers, the proliferation of innovative products & distribution channels and raising of supervision standards. Insurance penetration (ratio of insurance premium underwritten as a percentage of GDP) in life insurance is 4.4 % and non-life insurance penetration is 0.7% in 2010 India . While less than 15% of total population is covered under some sort of health insurance (including government supported schemes), Pension coverage is even lower with only about 12 % of the working population covered under the formal pension schemes. At present rate, only 50% of the population is likely to get covered under health insurance by 2033 . However, most of these Insurers have confined their operations in cities and gradual penetration in tier II & tier III cities. The insurance coverage in rural areas is extremely low and is confined mainly to the top 3 % of the rural population. Insurance companies in rural areas are reluctant to enter aggressively mainly on account of low levels of insurance literacy, perceived lower levels of the ability to pay premiums, fear of sparse coverage geographically and thus low levels of premiums. Clearly, there is a need for quicker and wider coverage. Rural market is supposedly tough for insurance companies and it’s only the subsidy based co-contributory insurance schemes for certain categories promoted by PSU Insurance companies that have made some inroads in rural areas. While LIC promotes Aam Aadmi Bima Yojana (AABY) & Janashree Bima Yojana (JBY) schemes in Life segment, it’s Universal Health Insurance Scheme (UHIS) by non-life PSU Insurers and Rastriya Swastha Bima Yojana (RSBY) by Ministry of labour & Employment in non-life- Health sector and “Swavalamban” ( NPS-lite) for pensions managed by PFRDA. Insurance sector, since opening up of the insurance sector has undergone two phases –the first one being from 2000-2005 which was focussed on increasing coverage followed by the second phase of 2005-2010 where the focus of insurance companies was on profitable growth. The sector now is entering in the third phase which aims at ‘stable profitable growth’. In an effort to ensure a balanced and speedy expansion of insurance coverage in the country, IRDA came out with regulations (Obligations of Insurers to Rural or Social Sectors), 2002. These regulations imposed obligations on insurers to sell a specified percentage of policies to rural public and cover a specified number of lives/assets belonging to people below poverty line or those pursuing certain traditional occupations. The Government of India set up a consulting group in 2003 to examine the existing insurance schemes for the rural poor; and on the basis of the group’s recommendations, the Authority issued IRDA (Micro insurance) Regulations, 2005. Consequent upon this notification, even though there has been a growth in the design of products catering to the needs of the poor, the rural penetration and density of Insurance products remains abysmally low. Not only the rural insurance and pension literacy is low but it gets further accentuated by the fact that insurance companies have not made any major efforts aimed at creating and capturing rural markets. It’s the beneficiary who is supposed to approach the insurance agent (unlike the urban market) as of now. Given the fact that there are plethora of schemes and each of them segmented on mutually exclusive domains and managed by different insurance company, it becomes almost impossible for the rural poor/ worker in an informal sector to make up his/her mind on the insurance policies to go in for. Moreover, because of the poor insurance literacy, the felt need is extremely low. And due to the fact that most of these poor / workers in informal sector have little savings on a long term basis, very little remains when one retires and the family is exposed to worst of economic hardships in case of any eventuality of the bread earner of the family. Moreover, there’s nothing left when one retires or has no job and the entire family suffers in old age. There also is an issue of what’s should be premium chargeable from them as too little makes the scheme unsustainable and ‘too high’ makes it impossible for this seg ment to contribute for. All this makes a strong case for a “Comprehensive Social Security Insurance scheme” covering life, non-life and pension under one scheme. IRDA has already allowed insurance companies to offer “health plus life combi product”, a policy that provides life cover along with health insurance. Presently, a tie-up is permitted between a life and a non-life co. Under the ‘combi products’ the underwriting of the respective portion of the risks is underwritten by respective insurance company. While this was intended to facilitate policy holders to select an integrated product of their choice under a single roof, the ‘combi product’ somehow hasn’t really been a success and we need to look into the reasons. The scheme is meant to provide a comprehensive Insurance coverage to workers (& their family) working in the informal/unorganised sector. The basic objective of having a social Security Insurance scheme is to bring in all those, who are otherwise left out of formal insurance cover especially Pensions, under Insurance coverage. As such, without restricting the coverage eligibility to an artificially defined line, it is proposed that anybody who is not presently covered under a formal pension scheme, such as Employee Provident Fund (EPF), Employees Pension Fund, Employees Deposit Link Insurance Scheme, Central Government Health Scheme (CGHS) & Employee State Insurance Scheme (ESIS), New (National) Pension Scheme (NPS) (tier I) and any other such scheme which is compulsory in nature for the employees and where the employer makes a co-contribution, will be eligible. a. Premium – Rs 300 pa. It will be a group insurance scheme and the family will be the unit. In the existing AABY & JBY scheme, the annual premium is Rs 200 and the coverage is Rs 30000, 75000, 75000 and 37500 for each of these categories respectively. 2. Health – Health insurance has to be an integral part of any comprehensive insurance scheme. It was initially felt that a health insurance scheme on lines of RSBY should be a part of this scheme. Since, it is envisaged to have a separate comprehensive Universal Health Insurance Scheme including preventive health, Maternity benefits and child care also, the health insurance is not being considered under this scheme. 3. Scholarship for Girl children – all the girl students, studying in class IX-XII will be eligible for scholarship whose parents opt for the comprehensive Insurance Scheme. The amount of scholarship will be @ Rs 800, 1200, 1800 & 2400 pa once the girl completes class IX, X, XI and XII respectively and will be given once a year at the end of the academic year and after she has passed the examinations. This will act as a conditional incentive linked aimed at encouraging the girl child to complete the secondary education. There will not be any limit on the number of Girl children to be covered under this scheme for a family. 4. Pension- the most crucial missing link presently leading to insecurity at the old age and associated issues is the presence of a pension system for workers and their families in the unorganised sector. Keeping in tune with what’s practised globally and pension principles, most of the pension schemes in the country have moved away from Defined Benefit to Defined contribution based system. The NPS scheme launched in 2004 is the latest such scheme. Funds are invested under a pattern defined by the regulator by the Pension Fund Managers with a twin objective of minimising the risk and maximising returns. In order to encourage workers in the informal sector to save for pensions voluntarily, a scheme called “Swavalamban” was launched by the Central Government in September 2010, wherein for a saving of Rs 1000-12000 pa, the Central Government makes a co-contribution of Rs 1000 pa for the first five years starting 2010-11. The funds are invested by the Pension Fund managers and annuities will be provided to the policy holders once they attain the retirement age. Due to various factors such as low awareness, lack of proper marketing of the product and structural issues, the coverage under Swavalamban has remained very low. However, a fact that the scheme as envisaged aims to target workers who can save in the range of Rs 1000-12000 pa and there are large number of workers who can’t save Rs 1000 pa. 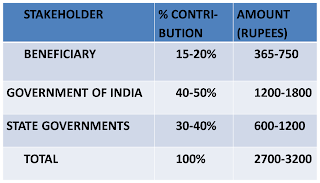 Moreover, it needs to be studied as to what’s been the average saving per account for every Rs 1000 contribution of the Central Government and as such the issue whether targeting wasn’t done properly needs to be examined. Taking Swavalamban as a guiding scheme in terms of Central Government contribution being Rs 1000 for a worker saving between Rs 1000-12000pa and its experience in terms of its failure to take off, it is proposed that Central Government contribution towards pension funds should be atleast Rs 2000 pa. Depending upon the age at which a worker enters the scheme, his annuity payable at the time of retirement will be determined. Moreover, it is a Pension scheme and not a saving scheme and as such, withdrawals before the retirement age will not be possible. Premium structure – whether beneficiary should pay and how much? We need to answer whether beneficiary should pay for such a scheme. The scheme basically by definition is based for the worker in the unorganised sector. The issues to be addressed are regarding his capacity to save voluntarily in the normal course and which he is willing to contribute as his share in the scheme. I am presuming that a worker is willing to save @Rs 5 per day ie Rs 150 per month or upto Rs 1800 per annum as the upper limit. Any premium above this will not be affordable by him. There’s also an issue of the collection cost and whether it will outstrip the premium itself. Regarding the willingness to pay, in a study conducted in 2005, it is established that there is a willingness to pay for health insurance . It is thus felt that there are tremendous advantages in mandating beneficiary contribution under such a scheme. The beneficiary will be a stakeholder and will be more aware about his entitlements. It will also imply the actual coverage of real beneficiaries and will guard against any misuse or inflated coverage. In the long run, it will ensure sustainability of the scheme. Accordingly, it is felt that there should be tri-partite agreement between Central Government, State Government and the beneficiary. While there are apprehensions whether the State Governments would agree to contribute in such a scheme, the experience under NPS-lite ( Karnataka and Haryana) and some of the other schemes (MSP based procurement of foodgrains – in MP, Bihar etc) have shown that States may like to get involved if they see a ‘political value addition’ in such a scheme. Moreover, it is felt that State Government’s involvement will ensure against wastage under the scheme and against any exaggerated coverage. In a typical first year scenario it is presumed that the beneficiary contributes Rs 500, State Government Rs 700 and Government of India Rs 1500 and thus the annual premium will be Rs 2700 per beneficiary. 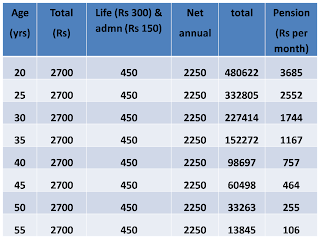 Figures in column 1 is age in years, the figures in column 2,3,4,5 represent annual figures in Rs while figures in last column are monthly pension due to the beneficiary. The above calculations are based on an average return of 7% pa (the actual return is higher in the range of 9-12 % and thus the yield would be better) and the returns based on the actuarial valuation are thus likely to be higher. However, these figures are not adjusted for inflation and considering a nominal inflation of 5% pa for this entire duration, the additional contribution required per annum, to keep the inflation adjusted value at the same level will be Rs 1845 pa for the age group 20 years to Rs 570 pa for the 55 age group. The requirement of funds from Central Government will be Rs 1800 crores (Rs 1500 crores towards life & pension coverage @ Rs 1500 pa and Rs 300 crores for Girl child scholarships) for every 10 million family coverage. The State Government’s contribution will be Rs 700 crores pa. Depending upon the increasing coverage overtime, the requirement of funds will increase @Rs180 crore for a million coverage for GOI and Rs 70 crore per million for the state Government. Implementation architectureSince two separate products – life (which is annual) and pension (which is annuity based accumulation) will have to be managed, an un-bundled architecture is proposed to manage the comprehensive social Security Insurance scheme, based on the NPS architecture being followed to manage the pension funds by the PFRDA and some of the best global practices in pension fund management. The unbundled architecture focuses on keeping the entry level agencies (Aggregators/point of presence), CRA (Central record keeping agencies) and Fund Managers separately. 1) POPs -So far, the POPs have included branches of banks (from both the public and private sectors), post office branches, depository participant offices and NGOs. 2) Aggregators - Aggregators shall be intermediaries identified and approved by the Central Nodal agency to perform subscriber interface functions in respect of their constituent groups. The Aggregators shall be entities already in existence having continuous functional relationship with a known customer base for delivery of some socio-economic goods / services. LIC, State Govt departments, State govt Societies such as SERP, WCD, NGOs etc are some of the institutions who could be an Aggregator. The Aggregator must be a registered body. The aggregators shall be responsible for a) Promotion of the scheme and awareness about the need for old age income security among its constituent group members; b) Meeting the ‘Know Your Customer’ requirements in respect of potential subscribers as mandated; c) Discharge of responsibilities relating to fund and data upload within prescribed time limits. d) Collection of contributions from subscribers and ensuring its passage to Trustee Bank;e) Ensuring availability of services to its underlying subscribers as mandated under the pension scheme; f) Handling grievances received from subscribers and their resolution. Each of the Aggregators will operate through a system of Facilitators. 3) Facilitators – the facilitators are the individuals who are based in the locality where the beneficiaries are and they are the last mile connectivity in the link of enrolment of beneficiaries and will provide the necessary hand-holding to each of the beneficiary. The existing network of LIC agents (about 14 lakhs), Business Correspondents (BCs), aanganwadi workers, ASHA workers, ANMs, Teachers are some of the categories who will be facilitators. They will all work on a commission on a per enrolment basis, to be decided by their Aggregators. CRA - the Central Recordkeeping Agency (CRA) will be a centralised agency at the national level to maintain the records of contribution and its deployment in various pension fund schemes for the Subscribers. CRA will carry out the functions of Record Keeping, Administration and Customer Service for all Subscribers under the proposed comprehensive pension scheme. The records of the contributions of each Subscriber will be kept in an account known as the Permanent Retirement Account which shall be identified by a Permanent Retirement Account Number (PRAN) (similar to what’s already available under the NPS system). CRA shall issue a PRAN to each Subscriber on his/her successful registration and maintain database of each Permanent Retirement Account along with recording of transactions relating to each PRAN. Trustee Bank – A nationalised Bank will be appointed as a Trustee Bank who will manage the banking of the Pension Funds in accordance with applicable provisions of the pension funds, the schemes and the guidelines/notifications issued by the Government of India from time to time as per applicable law. Exit clause: the purpose of having such a comprehensive insurance scheme is to provide old age income security and it is thus clear that the pension funds getting accumulated are not to be taken as a savings accounts and are not withdrawable before retirement.